M. Scott McLean and Julia Coffey as David Lyons and Jean Whittaker in James Graham’s “Labour of Love” at Olney Theatre Center. Photo by Teresa Castracane Photography. “Labour of Love” now playing on Olney’s Mulitz-Gudelsky Theatre Lab stage is an homage to the battle of the sexes that Hepburn and Tracey made so memorable, with a hearty dose of madcap comedy, and more than a fillip of culture clash adding to the zest. This is serious fun and should be on the must-see list. Even clocking in at a hefty two hours and 45 minutes, the play moves quickly and is just so laugh-out-loud funny that you don’t really notice. And even though it borrows elements of other styles, they have been fashioned into a wonderful new, uproarious model. …a delightful journey and one well worth taking. 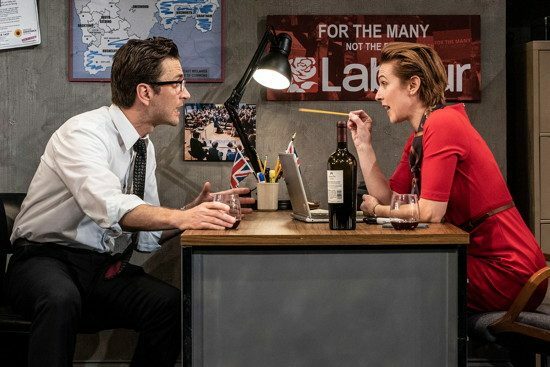 The winner of the 2018 Olivier Award for Best New Comedy is a clever comedy is about the ups and downs of left-wing British politics over the past twenty-five years since Thatcher. It takes place in a “safe” Labour seat in mining country in England; the MP who holds the seat is a first-timer assigned to the district. He thinks this is a stepping stone for him. So does his wife. Turns out—not so much. He ends up spending 25 years in this district. The story begins and ends with the rise of Theresa May’s party. Along the way, we get to witness the clash of values and class in a world where there are the true believers who want to hold a hard ideological line and those who want a more pragmatic, centrist approach. As the political parties shift in and out of power, the debate rages bitterly at times. The parallels to America’s current political climate are eerie. 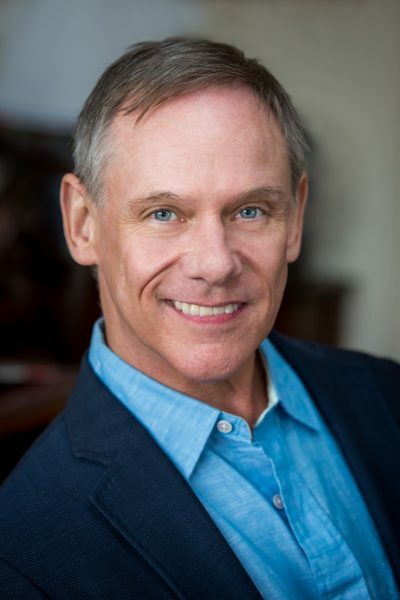 Playwright James Graham is a gifted playwright who breathes new life into political comedy. This is not only a timely import, but an insanely funny one. Echoing the structure of many plays, including Sondheim’s “Merrily We Roll Along,” the action starts on June 9, 2017, and then rolls back to 2011, 2001, 1994, and 1990. In the second act, we move forward from 1990 to 1994, 2001, 2001 and June 9, 2017. We watch as David Lyons (M. Scott McLean), the newly-minted Labour MP, arrives at his first political seat, along with his elegant, corporate-lawyer wife Elizabeth (Tessa Klein). He meets the local constituency manager, Jean Whittaker (Julia Coffey), who is ready to quit, and even more ready when she looks at David and his puppyish zeal and social-climbing wife. She is a card-carrying member of the Labour Party (there are actually only about 600 in the district, even though most everyone votes reliably Labour) and a true believer in the ideology underpinning the movement. David believes he is savvier politically and wants to work with Whitehall to effect change in steps, as well as earn a cabinet post (the only reason his wife has agreed to come to this Northern district). That sets the stage for a quarter-century of clashes and wins and losses. Jean stays on, although threatening to quit often. Elizabeth doesn’t stay on; she ends up in Cambridge (the Massachusetts one, not the English one). Len Prior (Marcus Kyd), a local council member, is the voice of the hard-line Labour party and in spite of the smiling face, works hard to undermine David, quite quietly. He plays his part with verve and a down-to-earthiness that seems so trustworthy. Everyman(woman) is represented by Margot Midler (a constituent and sometimes activist) played by Emily Kester; she takes a somewhat amorphous role and imbues it with a sense of everyday people jolted into political action. Brian Kim plays the hard-nosed Mr. Shen, whom David and Jean desperately court as an investor in their district. Watching them prepare for his visit after the Christmas and Boxing Day holidays is pure adrenaline. McLean and Coffey are so passionate and so well-matched as the MP and his constituent/campaign manager that you just want to watch them bicker and rage and hold each other accountable forever. The role of David could easily have become a stereotypical twit–the upper-class operative using the post as a stepping stone even as he believes he is bringing needed sophistication to this county. But McLean doesn’t fall into that trap (it could be fun and easy); instead, his David is a fully-realized man with hopes and dreams and a growing realization that he’s actually part of a larger purpose. He’s so good you see his heart grow as he stays connected to the county and Jean. He seems genuinely horrified when his wife returns in the second act; he’s simply outgrown her. Jean, as played by Coffey, is a revelation in comedic timing, and swearing. Her character has brought swearing to a fine art and the diatribes fall so effortlessly from her lips as she strides and paces the set that, combined with the annoyed-at-David facial expressions, the audience is just rolling with laughter. Coffey imbues this fierce daughter of the Labour movement (she swears she could never marry again unless it’s to a card-carrying member of the party) with an intelligence and loyalty that most candidates/representatives would die for. She’s also fierce enough to speak truth to power when needed. And when she’s brought up short by David, the subtle contortions in her face as she has to concede he might be right about something are a study in muscle control. This is a lovely cast who breathe and live these roles. The quick dialogue, the hysterical swearing (I now have a new phrase for expressing shock that can’t be repeated here), the very humanness of these people trying to bring a vision into reality is engrossing and supremely funny. The structure lends itself well to a light-hearted touch on some very serious issues, which resonate uncomfortably with America’s current situation. We get to watch David and Jean grow and change and come to new understandings. It’s a delightful journey and one well worth taking. Running Time: Approximately two hours and 45 minutes with a 15-minute intermission. “Labour of Love” runs from September 26 – October 28, 2018, at Olney Theatre Center, Olney, MD. For more information, please click here.